Fans of 'THE TOXIC AVENGER' rejoice as the 98 pound weakling Melvin returns to screens.....but not as you know him. 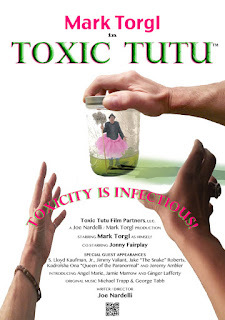 'TOXIC TUTU' is the almost true story of what became of Mark Torgl, who is celebrated for his starring role as Melvin the "Mop Boy" in the original cult-classic, horror film 'THE TOXIC AVENGER', and the unusual circumstances he reveals about his experience on the set of that film. Currently raising funds ($12,000) to help finish off their mockumentary film 'TOXIC TUTU', you can help towards funding by going to their Indiegogo page.